If you look north, you can see TN 385 is no longer north of I-269. Yes. As of whenever the TN385»I-269 changeover is made official, TN 385 will have two non-contiguous segments: between I-240 and I-269; and between US 51 and I-40. I don't understand why Mississippi keeps adding new interstates they know they can't afford to maintain and can barely justify to exist in the first place. Same reason Arkansas keeps building new highways? Add Alabama to that list too. Why do they need i-85 to go further? why does i-422 need to exist at all? i-14 (the entire route) really? come on! I see no reason for this highway to exist in MS at all. I believe the I-85 west extension project has been cancelled. So AL 108 will just be that stub forever? The Montgomery Outer Loop (AL 108) is still planned. What Cody was referring to was the I-85 extension west of Montgomery to I-20/59. Outside of I 269 from I-55 to I-22, I agree with you. That segment should be built and called I-22, because it connects Birmingham, Atlanta, and the southeast with Memphis. As for I-269 from the I-22 junction to the north through I-40, I would call that a complete waste of money. The sole raison d'etre for I-269 is funding connected to the overall I-69/HPC #18 corridor. TN at least had the good sense to insist that it be routed over TN 385, a planned and/or existing freeway facility, so their initial out-of-pocket expenses would be simply for that I-269 portion between the state line and TN 385. The I-269 "brief" was as an outer Memphis bypass eventually connecting to the parent I-69 at both ends. MS was eager to develop this particular corridor since the region anchored by Storm Lake, Hernando, and Olive Branch, due to both housing and commercial "spillover" from Memphis, is one of the fastest growing exurban areas in the South and needed a freeway corridor to tie the disparate parts of the region together. And once the I-55-to-Tunica section of parent I-69, while primarily initiated to expedite traffic to the gaming facilities along the river, was built a dozen years ago, finishing up the I-269 loop as an extension of that initial segment was inevitable. And now that the I-269 corridor in both states has become the focal point of regional commercial development, the entire concept is, to coin a phrase, "retroactively justified". Regardless of the initially proffered reasons for deploying the I-269 corridor to begin with, it is and always will be a means to an end -- the economic development of the Memphis-area periphery. Street View also shows that on mainline I-269 and at I-40, Jackson Miss is used as the control city for SB I-269. No surprise at all. The de facto TN position is, more or less, "I-22? Never heard of it." Now -- if businesses (shopping centers, auto malls, etc.) start cropping up along the N-S section of I-269 in TN -- particularly after the section from I-22 west to I-55/69 in MS opens to traffic -- then some trailblazer I-22 signage may start appearing on I-40 or other intersecting arterials just to prompt additional traffic to utilize I-269 and potentially patronize those businesses. When the Feds come up with I-69 money for TN and MS, you might see some signage updates for I-22 but dont hold your breath. I doubt it will ever happen. If Shelby/Fayette Counties were in TDOT's Chattanooga Region, then maybe (using I-59 as a precedent), but I don't expect to see I-22 signage with the TDOT Jackson Region. I am really curious to see how the I-55/69/269 interchange is signed once it opens and whether I-22 signs are posted there. I'd guess some sort of secondary (roadside BGS) signage indicating that I-269 is indeed the way to access I-22 will be posted at least SB on I-55/69. MS actually has vested interest in the I-22 corridor (unlike TN), so they have no reason to avoid posting some sort of trailblazers. 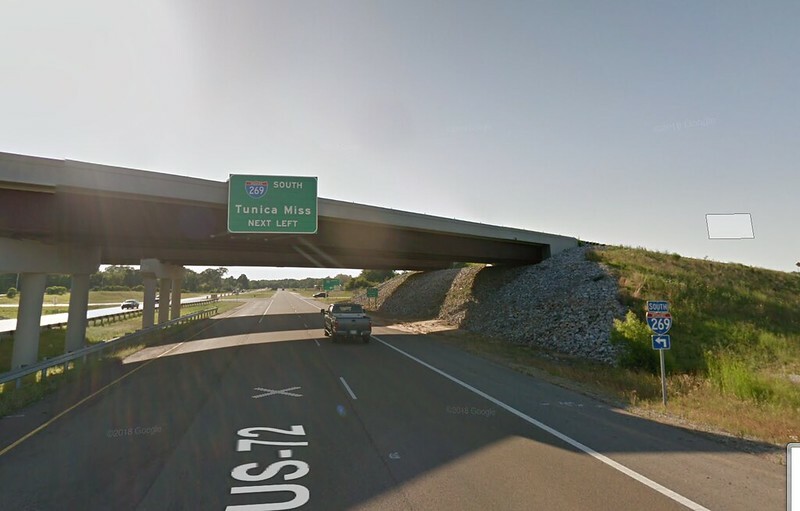 If you have to put up signs that say TO I-22, why not strip off the TO and call the road I-22? If a WB 22>SB 269 flyover had been constructed at that interchange rather than a standard cloverleaf, I'd be inclined to agree -- but snaking the mainline of a 2di around a 30mph loop just isn't considered optimal in most states (except IL, which has multiple instances). Besides, a "TO" notation for the relatively short distance involved is more than adequate -- at least for the time being. If there are issues with drivers being confused down the line, it's something that could be corrected with better signage. 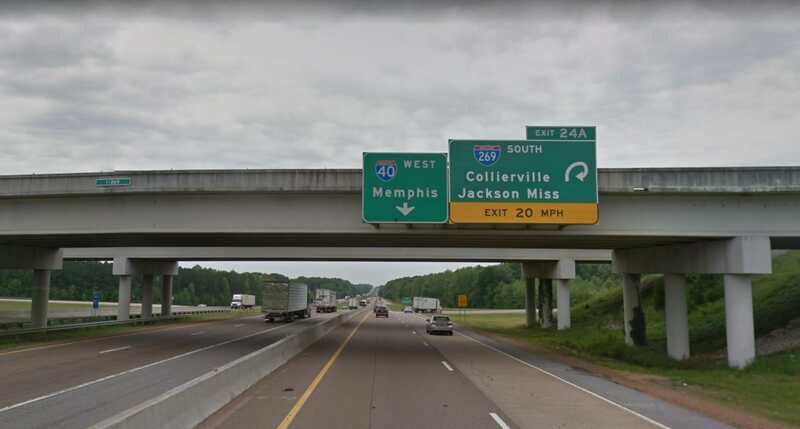 And since we've yet (at least on this forum) to see the signage plans (hint, hint to anyone who has access to such) for the interchange, we may be arguing over nothing -- MSDOT could do it right and sign the ramps to I-269 as "I-269 (whatever control city is used) TO I-22 EAST" right on the overhead BGS -- in which case, there should be no issue. But I'll be willing to bet that initially any I-22 reference will be reserved for secondary signage only -- and I hope I'm wrong about that! Lets not forget that dreadful cloverleaf on I-55 right up the road in downtown Memphis. That thing is awful and has been there for years. Addressed in some detail about 40-odd replies ago; (1) lack of funds despite plans being in place, and (2) TNDOT's not about to prioritize a section of I-55 that comes into the state and goes right out again. Oh, and (3) it's Memphis, never a fave with TN state government over the past few decades. Not to mention that I-69 itself goes through a loop ramp just a few miles west of I-22. Greater Memphis seems to be "cloverleaf central" (with the 40/269 interchange following suit). Face it -- for a cash-strapped DOT they're cheaper to build; they get the job done (not too elegantly, of course! ), and unless hemmed in with adjacent development, they can be later modified with flyovers. At least the newer ones feature C/D lanes to avoid main-carriageway weaving conflicts. Face it -- for a cash-strapped DOT they're cheaper to build; they get the job done (not too elegantly, of course! ), and unless hemmed in with adjacent development, they can be later modified with flyovers. On this note, keep in mind that Tennessee is a pay-as-you-go state. They do not float bonds for roadway projects. Indeed, which is why they weren’t able to afford the upcoming I-440 widening/reconstruction without raising the gas tax.